Enlarge/ A 1979 issue of Shang-Chi’s primary Marvel Comics series. Marvel Studios has already teased major announcements this week in the form of new Captain Marvel and Avengers 4 film trailers. But one additional piece of big Marvel news has leaked out before either of those dropped. According to Deadline Hollywood, Marvel Studios is moving ahead with a film based on the Shang-Chi comic series, which began in the ’70s and centers around a Chinese martial arts master. That report links Hollywood scribe Dave Callaham to the project as the film’s writer. Callaham’s film-writing work revolves largely around action and geek-culture films, ranging from 2005’s Doom film adaptation to 2010’s first Expendables film. He has also written or co-written scripts for unreleased films Wonder Woman 1984, Zombieland 2, and Spider-Man: Into the Spider-Verse 2. Deadline’s scoop comes ahead of any other major names attached to the project—meaning, no director or actors. It includes an indication that Marvel wants to match the project with an Asian-American director, in the same way that February’s Black Panther film revolved around African-American writers and directors, and to “avoid stereotypes” found in the source comic series’ original issues. 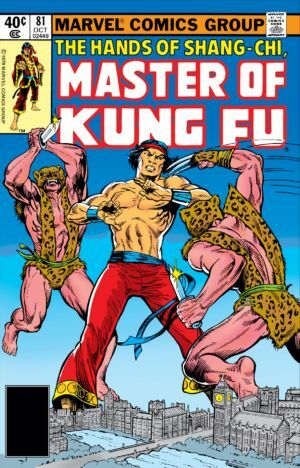 In 1972, white Marvel staffers Steve Englehart (writer) and Jim Starlin (artist) were tasked with making an original series that tapped into the popularity of martial arts action films—and would make up for Marvel’s failure to get the comic rights to the TV series Kung-Fu. Though the character of Shang-Chi has persisted through Marvel Comics books over the years, particularly his recruitment to the Avengers team in 2012, the character has not been formally introduced or loudly hinted to in any recent film or TV project.